The Cheltenham clock is ticking. Its hard to believe but we’re just 43 days from Day 1 of the “Greatest Show On Earth”. The Cheltenham Festival. On Saturday we had Cheltenham Trials Day. Next weekend we have the Dublin Racing Festival and Scottish Cheltenham Trials Weekend at Musselburgh. In this week’s article I am going to look at Frodon’s Gold Cup credentials. A Colin Tizzard trained runner who looks well handicapped if returning to fences. Oh, and why I think Gordon Elliott could be celebrating Grand National success in April. All this and more inside..
Just six runners went to post for this years Cotswold Chase, a race classed as Gold Cup Trial. However, recent years the stats suggest that it’s not been a good guide to events in March. In the past 11 years only two horses who ran in the race have gone out to place in the Gold Cup: Djakadam who fell in the race before going onto finish runner-up to Don Cossack in 2016. The Giant Bolster won the 2014 Cotswold Chase before finishing 3rd in that seasons Gold Cup. After the race trainer Paul Nicholls seemed to be of the opinion that the 7-year-old would head for the Gold Cup rather than the Ryanair Chase. Can he win a Gold Cup? Well we know he loves Cheltenham (4 wins from 10 runs 6 placed 60%). He’s ground versatile and an excellent jumper when he gets in a good rhythm. Some solid positives there but there are two main reasons why he won’t win the Gold Cup. Firstly, it’s highly unlikely that he will get a soft lead in a Gold Cup, with the likes of Native River in the field. Secondly, the extra furlong he has to travel in the Gold Cup looks a step too far on the stamina front. Yes, I can see him giving his jockey a great spin to two out before he weakens out of it. The Ryanair Chase would seem a better option for Frodon but I can see why connections will probably roll the dice and go for the big one at the festival, especially on a ‘soundish’ surface. Runner-up Elegant Escape ran a perfectly good race with the Gold Cup in mind and I think he can reverse form with Frodon should they meet again in March. Especially if the ground is more testing than on Saturday. Firstly, the Colin Tizzard stable hasn’t exactly been in great form of late just 4 winners from 44 runners. Secondly, Elegant Escape has abundant stamina, as he showed when winning the Welsh Grand National. Finally, the pace of the race is key. The more solid the gallop the better he jumps. A stop, start gallop like he got on Saturday really doesn’t help his jumping. The further they went the better he was. A soft ground Gold Cup run at a strong gallop would be ideal for the 7-year-old. If he gets those conditions I can see him going very well. This week’s notebook horse also comes from Trials Day and its West Approach, trained by Colin Tizzard. The 9-year-old was a distant second to easy winner Paisley Park in the Cleeve Hurdle, beaten further than he was by the same horse at Ascot. The 9-year-old isn’t a natural over fences but I think he’s handicapped to win a nice pot over the larger obstacles when everything falls right. Will connections continue running Thistlecrack's half-brother over hurdles and head for the stayer’s hurdle? Or will he return to fences and a handicap like the Brown Advisory and Merriebelle Stable Plate on Day 3 of the festival? I don’t think he has a realistic chance of beating Paisley Park in the stayers hurdle although he can reach the places. So, I am hoping we’ll see West Approach in one of the festival handicap chases. It’s worth remembering he was a good third at Cheltenham on his seasonal reappearance and 5th in the Ladbroke Trophy in the autumn. Can the Don Master The National? After this season’s Becher Chase I put the Gordon Elliott trained Noble Endeavor on my shortlist for the Grand National. Having watched the race again I am also coming around to the claims of Don Poli. The 10-year-old ran a fair race on his first start after 664 days off the track in the Becher. He ran well to half way before becoming detached and eventually being pulled up. Granted he ran even worse when behind Presenting Percy over hurdles on Thursday. At least these poor runs have protected his mark and he should drop a 1lb or two further. It could be he’s now gone at the game but I for one will be interested to see what weight the handicapper allots him for the National. 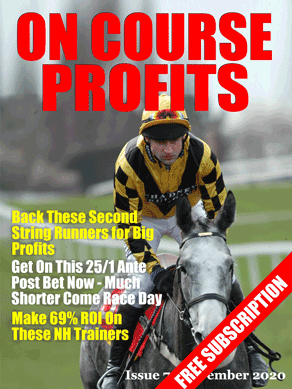 2:20 – Annie Bonny was to keen on her handicap hurdle debut at Leicester two start back. But ran a lot better when 5th of 10 at Chepstow three weeks ago. Doing her best work at the finish she should be suited by today’s 2m 5 ½ f at a track like Ludlow. She’s also fairly lightly raced to think that she maybe capable better still and I expect her to go close.